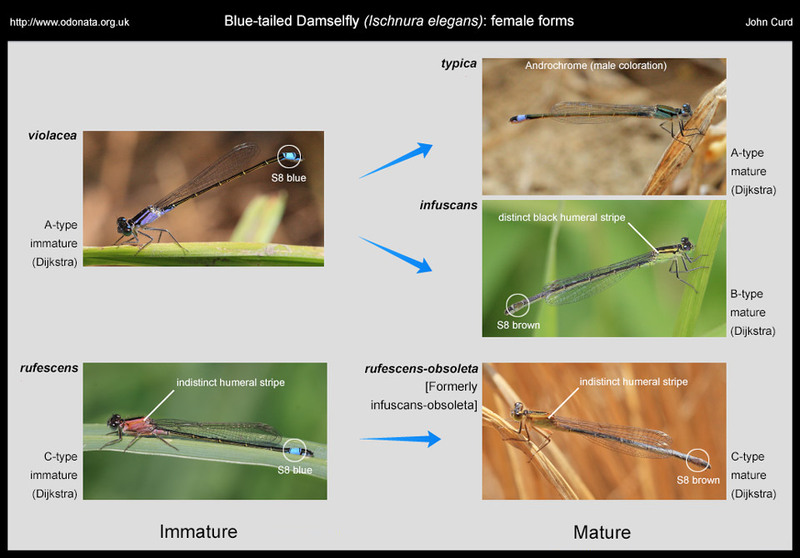 The Blue-tailed Damselfly/Common Bluetail (Ischnura elegans) boasts a glittering array of different colour form females. The normally documented forms number 5, 2 of which are immature colour variations and 3 of which are mature. To trap the unwary, one of the mature forms is androchrome, resembling the mature male. Not only does one of the female forms resemble the mature male but the immature male introduces a 6th colour form with a turquoise thorax. Those are the colour forms that most [all?] of the books document. What I have not seen the books mention is that not all those with a turquoise thorax are male, some are female. Furthermore, a friend and fellow odo-nutter, Steve Cham, has mentioned yet another brown variant so there actually seem to be at least 7 female colour forms, 2 of which don’t appear in the literature (that I’ve seen, at least). Finally, just to confuse communication a little there are a couple of different naming conventions in use for the female colour forms. There are older “traditional” names with a scientific/binomial style (violacea, rufescens, typica, infuscans and rufescens-obsoleta) and newer, “simpler” names (A-, B- and C-type, mature and immature) proposed by K-D Dijkstra in his excellent book [simpler but less romantic, IMHO]. 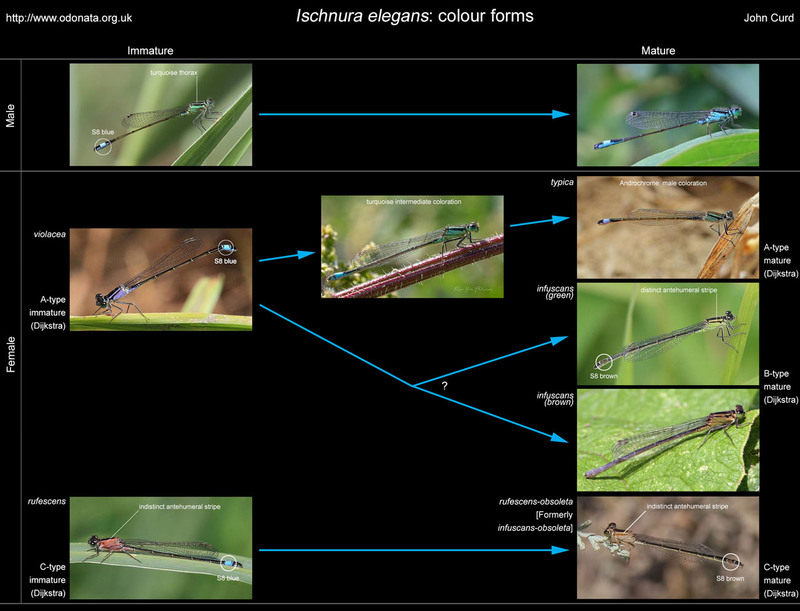 I began by developing the diagram below in an attempt to clarify the 5 female colour forms generally documented, which should be sufficient for most. Then, to complete the picture, I firstly added the male development process. That diagram didn’t last long before almost immediately gaining the additional 2 female colour forms for which I make the following notes. My placing of the female turquoise coloration is something of an assumption. Since the turquoise male changes into the familiar mature blue colour, it seems reasonable to assume that the turquoise female might also change into the blue form, i.e. typica. Furthermore, typica females begin life as the violacea form so it also seems fair to assume that the turquoise might be an intermediate form between violacea and typica. The brown form is clearly a variation of infuscans because it has a distinct antehumeral stripe. The photograph below appears to have a hint of green underlying the dominant brown colour so I wonder if the brown infuscans form is actually a further development, perhaps aging, of the more usual green infuscans form. I am indebted to Roger Hale for his photograph of the female turquoise form [below centre] and to Steven Teale for the brown infuscans form [below right].